200 height looks like this! This the pressure anom for July 2013...but does not come up as an ftp file it is unfortunately! Sorry yes it now does come up!lol! 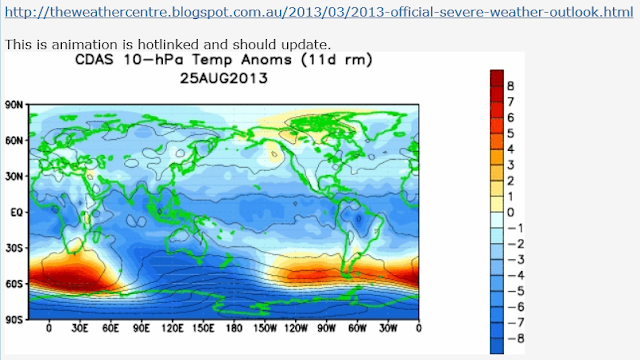 And here is 200hpa height for July 2013. Enough info overload for you there, Crikey! from lowest colour min to almost the highest colour max! Those last 2 charts have vanished, but can be found on BOM site! NERD 65 has reported a deep southern ocean on another thread. I had a look at the upper stratosphere 10hPa and there is continuing atmospheric waves orbiting around the south pole. This action seems to be creating warm stratospheric anomalies at the crest of the waves. Quote:”Antarctic sea ice extent for August 19 is 18.70 million square kilometers (7.22 million square miles), a record or near-record high level (August 19, 2010 was similarly high), led by unusually extensive ice in the Bellingshausen, Amundsen, and Ross seas, and in the western Indian Ocean sector. An amazing Report of record swings of temperature extremes in Sth America. On August 29th the temperature soared to 32.6°C (90.7°F) at Bahia Blanca, Argentina, an all-time record for the month of August. This follows a reading of -7.9°C (17.8°F) recorded on August 25th, their all-time record low for the month! The site has a POR (period of record) of over 100 years. Their normal daily range of temperature during August is 9.2°C-16.0°C (49°F-61°F). Looks as though the events in the stratosphere are linked. 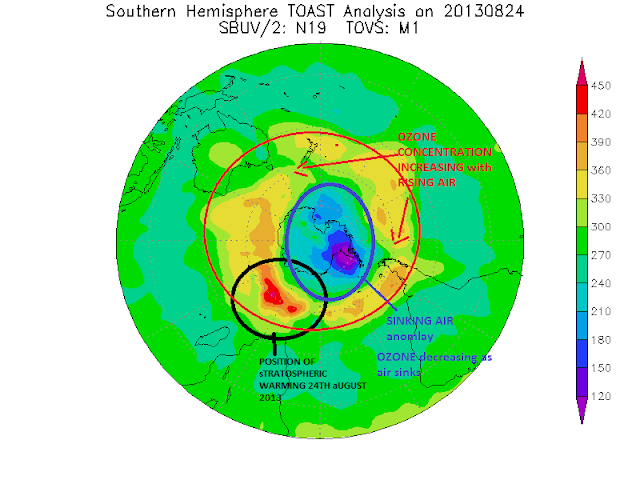 THe article showa the anomalies of 500mb geopotential height. I'm finding this thread very fascinating. Keep it coming crikey. Hey.. Glad you are following stormy-bec! They don't appear to be rotating around the south pole like they were in the earlier months. Currently the 200hPa jet stream is very wavy/meridonal. 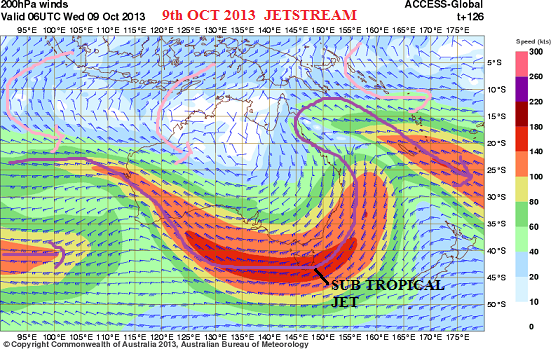 The sub-tropical jet next Wednesday the 9th oct 2013 will dip as low as the TASMANIAN LATITUDE!! 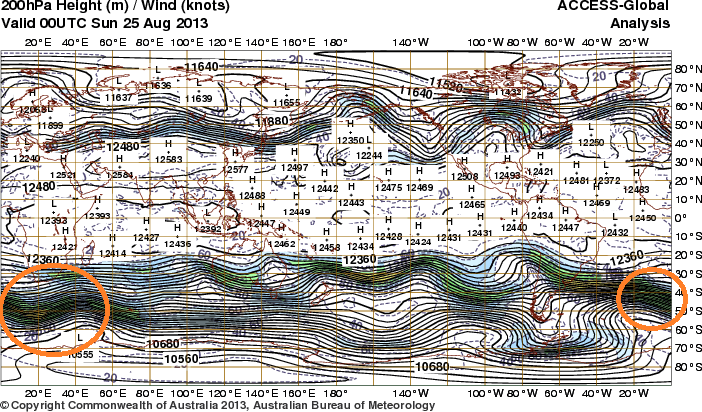 I have never seen the sub-tropical jet that far south!! 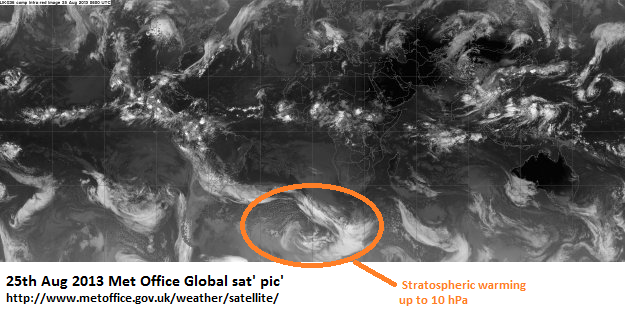 This will be accompanies with a large high pressure cell seated in the trough of the sub-tropical jet!! centred as far north as Brisbane!! 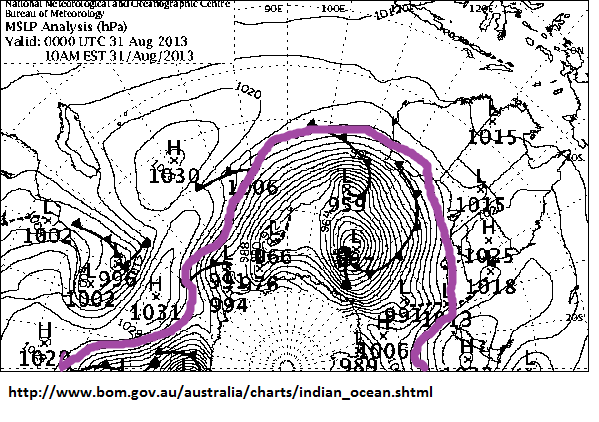 with some severe troughing to the east in the coral sea near the Islands once again. Hey Crikey , spot on with your prediction and forecast. Hobart on Wednesday forecast for 24 degrees !! 7 over average , but after 23 here yesterday I would say it's a good chance of being much warmer. It looks as if the current SSW was retrograding around the 7th/8th of this month, is that normal behaviour for these events? 'It looks as if the current SSW was retrograding around the 7th/8th of this month, is that normal behaviour for these events? Notice the SSW cranking up in the NH as it should for their winter. Worth quoting the post below at this time - just watch how the the warming fades away to nothing before popping up again to the SW of Australia. Interesting to watch how these changes tie in with the SAM - would love to be able to explain it away but way above my head. Instead just watching the patterns and learning slowly. Is there such a thing as a Stratospheric Cooling event? Reason being 10hpa temps look very cold at the moment in both SH and NH, or is this what we consider normal? No such thing that I have ever heard of CS in my long career, and googling it produced zip also! Thanks BD. I also could not find anything on Google, hence why I thought I'd ask. I suppose you could argue that this was a stratospheric cooling event in general. Perhaps a repeat of last year emerging? Could be Crikey! Will be interesting to watch and see what eventuates. Below is a bit of a write up(without his fancy charts) from Joe D'Aleo on this very subject that you might find interesting. Will a stratospheric warming take place again this winter? We know the AO and NAO play a key role in the Northern Hemisphere winters. A negative AO/NAO is associated with polar high pressure and upper level warming that causes cold air to push south into mid latitude continents. Often a collapse of the AO/NAO is precipitated by what is called a stratospheric warming. See the one that developed in late December last year. It took a while to have a major impact on the weather as the pressure rises did not reach the critical 500mb level mid troposphere right away in any significant way. It really was late winter and spring that did and the late major blizzards of the late winter and spring resulted. The SSWs begin with a bubble rising into the stratosphere in South Central Asia that starts a disruption and sinking into the polar region. See also how it affected UK in similar fashion with collapsing AO spikes tied to UK cold periods. A very good description of the phenomena and the causes by a television producer by day, who as a hobby, studied climate and weather nights and weekends for over 30 years (here). The classic high latitude stratwarms/blocking of course was the 2009/10 winter when two pulses took place and dominated the entire winter. I wrote about it early in November that year here. The general rule has been the westerly QBO at solar max and east at solar min had a tendency for SSWs but in the long solar minimum of recent years, it did not seem to matter with warmings and blocking almost every winter. The 2010/11 winters started blocky out of the box and had rebound warmings in the mid trop near 500mb in early February when a major snowstorm occurred. It has been cold in the arctic so far with a positive AO. The animation that follows shows a warming in the North Atlantic/arctic. No sign yet of a south central Asia disruption beginning. As the animation above showed, it moves very fast once it begins. The descent back down into the troposphere may lag weeks. With the sun near a solar max (not a great one) and the winds westerly throughout the stratosphere, one might expect one to occur this winter. The other solar max year in a relatively weak cycle with a similar west QBO was 1969/70. A cold event always follows a warm event(SSW)I note In NH where they really get them SH events are fairly weak in comparison!